The Fishing... a remote fishing adventure awaits you. Winnipeg River Walleye are spread out between creeks mouths and fast current locations in the early spring. The fish then migrate to reefs and points in that spring. Once the weed beds are up in mid-summer the fish can also be found chasing perch and other bait fish. Spinner and jigs with dead minnows as bait seem to work best for walleyes. Smallmouth bass start hitting on the shorelines and back bays, and then move deeper and by fall they're on points in the main river channel. Top waters are great early in the year, then switch to diving crankbaits in summer and to jigs and artificial baits or crawlers in the fall. Our experienced on-site guides can steer you in the right direction with our custom-made Trail End Camp maps of the river. Our general store carries bait and tackle and the guides can assist you in what works best for your type of fishing. Treat yourself to Trail End Camp's professional guide service. Enjoy your day with a guide as you sit back, relax and pull in the fish. Take pleasure in a delicious shore lunch cooked for you over an open fire. 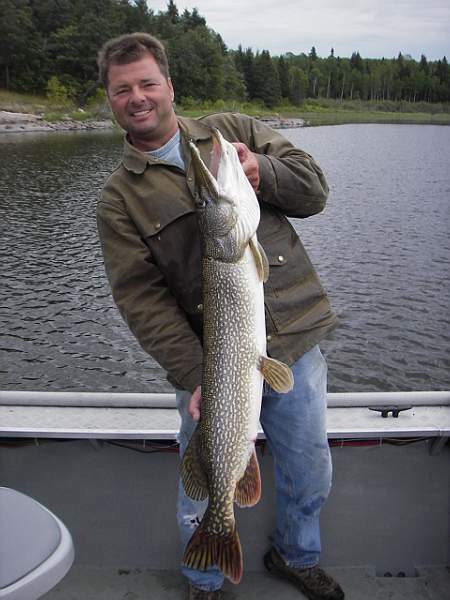 Try one of our guides "special recipe" of Cajun pike or sweet and sour walleye. Fried onions and French fries top off your tasty lunch. "While good in any setting, the fish always tastes best when eaten outdoors on a rocky island overlooking a Canadian river."